Happy Friday! Let's head for the weekend with a classic that was atop the Billboard Hot 100 charts exactly 50 years ago. Take it away, Otis Redding . . .
Big picture: Thursday brought White House bombshells on foreign policy and trade that could reverberate through the energy sector. 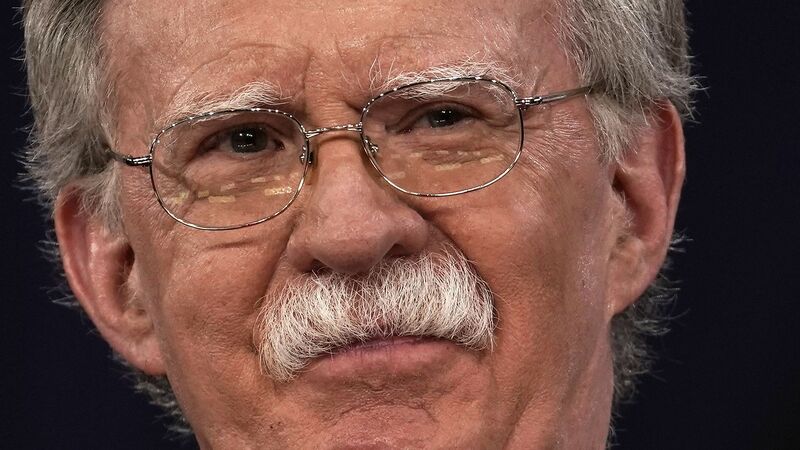 Get ready for more sanctions: President Trump’s pick of the very hawkish John Bolton as National Security Adviser is another sign that Trump plans to abandon the Iran nuclear deal and bring back sanctions. Nobody knows exactly how many Iranian barrels that would remove from the market. As we noted here, Joseph McMonigle of Hedgeye Risk Management has estimated up to one million barrels, but others see less effect unless other countries also reimpose sanctions. Get ready for more tariffs: Trump announced yesterday that he’s planning new tariffs against China that could amount to $60 billion. That could have energy spillover effects. But, but but: On a head-spinning day, the White House also said it’s greatly expanding the list of nations that will be exempt — for now — from steep tariffs on steel imports. The EU, Korea, Brazil, Argentina and Australia now join Canada and Mexico. The steel penalties announced a few weeks ago are a big deal for the oil-and-gas industry, which relies on specialty products companies say they can’t source domestically. The intrigue: In a sign of how uncertain the rapidly changing landscape is, ClearView Energy Partners said in a note Friday that the expanded list of exempt countries could cut both ways for the industry. “[S]uch broad tariff exemptions could contribute to greater Commerce Department scrutiny — and, potentially, greater opposition by U.S. steel producers — when energy-sector end-users apply for product-specific exclusions to imports from countries that did not receive exemptions,” they said. State of the market: Per Bloomberg, oil traders are weighing the Iran implications of the Bolton pick and the new China trade fight. “Prices are headed for their biggest weekly gain in a month, despite slumping Thursday after Trump’s call for tariffs on at least $50 billion of Chinese imports fanned worries about global economic growth,” they report. Underwhelming: Let's spend a little more time with the Interior Department's Gulf of Mexico lease sale Wednesday that, as we noted here, drew modest bidding and interest despite making 77 million acres available. The chart above shows just how low the bidding was by historical standards by comparing it with the top 10 most lucrative Gulf sales (based on these records maintained by Interior's Bureau of Ocean Energy Management). Why it matters: While the sale was scheduled during the Obama years, Interior's decision to make so much acreage available, the lowering of shallow-water royalty rates, and the tepid bidding bring two trends into focus: The Trump administration's aggressive promotion of U.S. fossil fuels and the wealth of other options that companies have outside the Gulf. “It’s good for oil and gas companies, not so great for the U.S. taxpayer, but it is consistent with this whole ‘energy dominance’ theme. The funny part is, we’re already energy dominant as it is, or on track to be energy dominant, from our onshore assets. We really didn’t need the offshore assets, we could have held them back to wait until prices were higher,” he said. Shared mobility: Chinese ride-hailing giant Didi Chuxing will build electric vehicles via a joint venture with CHJ Automotive, a local automotive startup that also announced RMB3 billion (US$473 million) in new funding, according to media reports. Why it matters: As ride-hailing services continues to grow in prevalence and replace car ownership, electric cars can help them be more efficient. Didi and others like Uber have already been experimenting with and promoting EVs for their services, notes my colleague Kia Kokalitcheva in the Axios stream. GM lobbying: A newly public lobbying registration shows that GM has tapped the DS2 Group for work on "monitoring issues on autonomous vehicles and electric vehicles." Nissan: The Wall Street Journal reports from Japan that Nissan is aiming for a big jump in EV sales over the next five years, with a focus on the big Chinese market. "In an ambitious bet on future demand, the Japanese auto maker said Friday that it aims to sell one million battery-powered vehicles per annum through the financial year ending March 2023," the paper reports. The target includes both pure electrics and battery-gasoline hybrids. Climate change: The latest podcast from UPenn's Kleinman Center for Energy Policy is a good, wide-ranging overview of cap-and-trade policies and carbon pricing more generally in the U.S., Europe and elsewhere. One interesting point: Wharton School of Business economist Arthur van Benthem cautions against worrying too much that CO2 pricing causes companies to move industrial operations to regions without such policies, noting fears of industries fleeing Europe due to the EU's emissions trading system have been proven unfounded. “The academic literature suggests that this issue is very much overplayed. There is hardly any evidence that firms leave in response to carbon prices that are below $50 per ton,” he said. EVs: The Columbia Energy Exchange chats with Ryan Popple, the CEO of the electric bus company Proterra. They cover some interesting ground, such as how municipal electric bus adoption is happening in regional clusters, and why oil prices did not materialize as a major threat to the company when they cratered a few years ago, in part because battery costs were falling faster. Pipelines: A new episode of Off The Charts, from the University of Chicago's Energy Policy Institute, explores the increasingly volatile politics of pipeline regulation and construction. Nuclear: On the new Titans Of Nuclear podcast, Breakthrough Institute director of energy Jessica Lovering dives into next-wave nuclear tech, like small modular reactors, and the prospects for deployment. More than a dozen business schools and some of Wall Street’s biggest firms are converging for the next two days at Duke University to discuss the business effects of climate change. Why it matters: This conference is being billed as the first to bring together students from a range of business schools to address the issue. That reflects both how climate change is becoming more of a tangible business concern and that younger people care more about it than older generations. One level deeper: More than 150 students and 80 other attendees are expected to attend this inaugural conference at Duke’s business school in Durham, N.C.
JPMorgan Chase is a lead sponsor, and other big-name Wall Street firms sending speakers include Goldman Sachs, Morgan Stanley and Lazard. Another sponsor is Equinor (formerly Statoil), a particularly progressive oil company when it comes to climate change. Many of the sessions will be live-streamed here beginning at 5:30pm ET today. What’s next: It’s not that big yet, but its organizers intend for it to grow as it rotates to other business schools in future years. Forecast of LNG demand growth from BNEF's "Global LNG Outlook 2018". Screenshot: BNEF's "LNG Trade to Surpass 300MMtpa for the First Time This Year, as Asia and Europe Drive Up Imports"
New forecast: Bloomberg New Energy Finance said in a new forecast that global import demand for liquified natural gas will grow 7.2%to reach over 300 million metric tons this year. At the same time, the report notes that this year's growth is slower than last year, and the demand slowdown is expected to continue for another couple of years before accelerating again (see chart above). 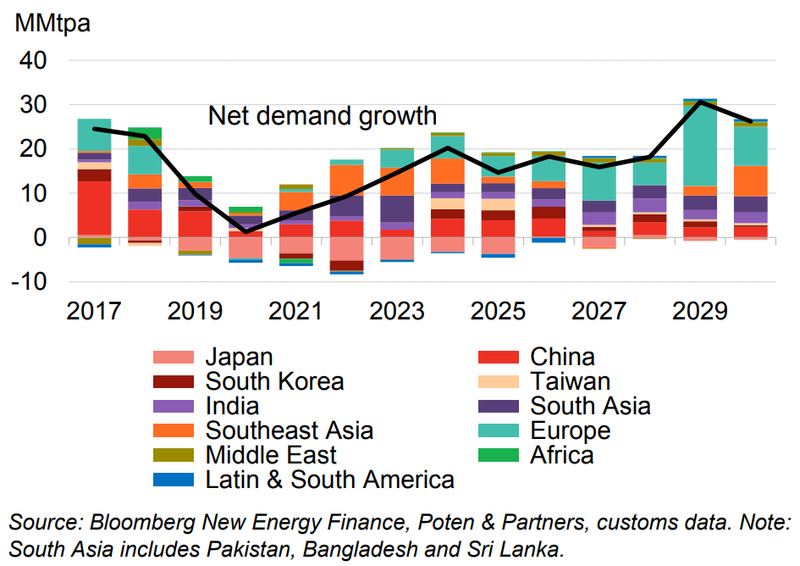 State of play: “The growth rate in 2019–22 will slow as the commissioning of new gas pipelines from Russia absorbs some of China’s demand, and as more nuclear power comes online in Japan," said BNEF analyst Ashish Sethia in a statement. One reason it matters: A summary of the report explores the intersection of LNG growth and wider energy and ecological trends. It notes that rising LNG demand through 2030 will be driven by China's turn to cleaner alternatives to coal, rising gas needs for power generation in Asia more broadly, and reduced domestic production in Europe. Another reason it matters: BNEF's report is the latest of several analyses warning of a potential LNG supply shortfall opening in the mid-2020s absent more supply contracts that drive infrastructure investment. "New contracts are...needed to underpin final investment decisions on new supply projects by 2020, to provide sufficient supply capacity in the market post-2025," it states. Editor's note: The second story in yesterday's Generate was corrected to compare the omnibus to the White House's FY 2018 proposal and not FY 2019 proposal.